Pink Mist, a Bristol Old Vic production by Owen Sheers, will tour the UK from 23rd January to 1st April 2017. 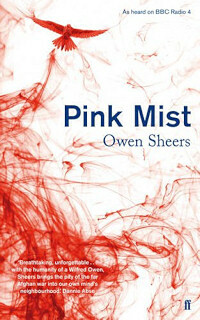 Pink Mist tells the story of three young Bristol men deployed to Afghanistan. Returning to the women in their lives who must now share the physical and psychological aftershocks of their service, Arthur, Hads and Taff find their journey home is their greatest battle. Owen Sheers’ Pink Mist was inspired by 30 interviews with returned servicemen and first staged at Bristol Old Vic in 2015. “Fearlessly lyrical in its imagery” (The Times), this critically acclaimed show directed by John Retallack matches Sheers’ haunting verse with dynamic movement from George Mann (Theatre Ad Infinitum). Pink Mist will also run at Bristol Old Vic from 23rd to 28th January 2017. What unfolds before the audience in Pink Mist isn’t just dance; it isn’t just theatre; it isn’t just performance poetry. It’s all of these things and more, far more than the sum of its parts. Owen Sheers has won Wales Book of the Year at a ceremony in Caernarfon for his work about three young soldiers. Pink Mist also took the Roland Mathias poetry award. Sheers told BBC Radio Wales it was a "fantastic surprise" to win. "It's a book that started with around 30 interviews I did with recently wounded service personnel and their families," he said. "I actually did those interviews for a stage project called The Two Worlds of Charlie F, but when that finished I found that I still had so much more that I wanted to say and there were so many stories I hadn't been able to tell on stage, so that's when Pink Mist was born."